Winner of the Best Book With Facts Blue Peter Book Award 2017Beautifully presented in a large, hardback format, and fully illustrated in colour throughout, this wonderful anthology is a treat for all the family. Be shocked and amazed by these incredible real-life stories of extreme survival, including… The Man Who Sucked Blood from a Shark, a sailor who survived for 133 days on a raft in the Atlantic when his ship was torpedoed, using shark’s blood in place of fresh water. The Girl Who Fell From the Sky, a teenager who fell 2 miles from an aeroplane and trekked through the Amazon jungle to safety. The Woman Who Froze to Death – Yet Lived, a woman who was trapped under freezing water for so long her heart stopped. Four hours later, medics managed to warm her blood enough to revive her. 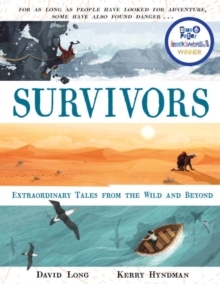 Combining classic tales such as Ernest Shackleton’s Antarctic voyage, as well as more modern exploits such as the adventurer who inspired the movie 127 Hours, these astonishing stories will be retold by young readers to all of their friends.